While we love all of our extension methods, there are certain transformations that are extra close to our hearts. Our Crown Extensions have such a deep impact on both the women receiving them and our team creating the transformation. If you’re not familiar with a Crown Extension, it is a hair piece that covers the crown, or top, of your head. They are a hair extension solution for women with thinning hair, areas of hair loss, and to provide more coverage in conjunction with traditional integrated extensions. Because Crown Extensions are one of the lesser known categories of extensions, we wanted to walk you through all the details—who they’re for, how they work, and the investment involved. First up—the difference between traditional extensions and crown extensions. Traditional extensions are typically attached to the sides and back of your head. They blend into your natural hair because the top layer of your hair (coming from the crown of your head) covers up the extension attachments. If the amount of hair at the crown of your head isn’t dense enough to provide coverage to the back and sides, traditional extensions may not be possible for you. Enter: Crown Extensions. Crowns are a great option for women missing coverage or experiencing thinness on the top of their head. They can be worn on their own, or in addition to traditional hair extensions for more coverage throughout the sides and back. There are two main categories of Crown Extensions. First, there are “temporary” crowns, which are typically attached with clips. They can be taken on and off each day. Temporary crowns offer more convenience as there is no in-salon maintenance involved, along with potentially lasting longer if you choose not to wear it every day. The second type is “semi-permanent” crowns. These have a variety of attachment methods, including bonding rings and integrated methods. Semi-permanent crowns require a much larger time and energy commitment. They require regular in-salon maintenance (every 2-4 weeks), and extra care at home as well. If you’re wondering which of these might be right for you, we use a pretty simple scale to determine the answer. On a scale from 1 to 10 (10 being the most), how much does your hair loss, thinning hair, or area of concern bother you? If the answer is less than 7, we strongly recommend a temporary crown extension. If the answer is 7-10, we recommend the semi-permanent method of extension. There’s one other factor that plays into whether you choose temporary or semi-permanent. If you have lost 50% or more of your hair, integration would not be possible for you. Less than 50% loss still allows for integration to be considered. Both temporary and semi-permanent crown extensions have a lifespan of 8-12 months. If you have a temporary crown and choose to wear it more sparingly rather than every day, it could potentially last a little bit longer. We do not recommend crown or any type of extensions for women still actively experiencing hair loss. The ideal time to begin wearing hair extensions is after you stop shedding. This is due to the extensions (whether temporary or semi-permanent) being attached to your hair. Attaching to your hair while actively losing hair could contribute to faster loss and may cause slipping of your extensions due to the instability of attachment points. The only exception to this rule is if your loss is in a particular area and the hair surrounding it is strong enough to support the extensions. Let’s talk investment. Due to the detailed construction of crown extensions, the pricing is on average slightly more than traditional hair extensions. Crown extensions may also need to be created custom, which takes longer and can potentially increase the cost. Typically, the investment ranges from $2,000-$3,500. If you do not need a custom crown, the extension can be ordered and received typically within a few weeks. However, if you do need a custom crown, it can take up to 4 months for the crown to be created and received. Finally, the time investment ranges based on the method of attachment. With temporary crowns you must be willing to take the time to put it on and style it every day (or as often as you choose to wear it). For semi-permanent crowns you must commit to coming into the studio every 2-4 weeks for maintenance. The maintenance appointments range from 30 minutes (for a “mini” tidy up) to a 3+ hours for a “full service” where the crown is removed and reapplied. You absolutely must be willing to commit to this maintenance schedule in order to ensure the health and integrity of your hair and extension piece. Like all other methods of extensions, crown extensions are simply a category within the extension world. Because it is often a delicate hair situation, it is absolutely vital to find a stylist or salon that is well-versed in crown extensions. 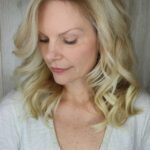 Candice has been trained in Trichology (the study of the scalp and hair), along with having extensive experience with several different methods of crown extensions. Our current academy team has a love and passion for crown extensions as well, which means that our education has included an added focus on this method. If you’ve been told traditional hair extensions won’t work for you, or if you are experiencing thinning hair or have a particular area of concern, we invite you to fill out an application here!. Our passion is helping women find confidence and self-love through hair extensions, and we would love to share that with you. Let’s talk. Our very own Salon Coordinator, Susan, first came to Garnish as a guest of the salon seeking hair extensions. She’s been wearing her hair extensions now for about four months and is a full-on believer in how life-changing they can be. 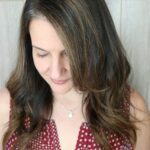 We absolutely love Susan’s story with hair extensions, so we wanted to shine some light on her experience in the hopes that all the other busy moms out there can relate. 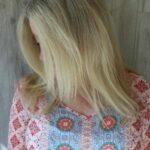 What brought about your decision to try hair extensions? About three months after the birth of Shep (her adorable baby boy), I noticed that my hair had thinned out a lot. I had never been able to grow my hair out past my shoulders anyway and now it was even thinner. I also realized that before having my baby I always wanted to get ready and go out and do something, and after having him I just wanted to stay at home. I realized I didn’t want to live in sweatpants all the time, and I needed to find a way to feel like myself again. What changed for you when you got your NBR Extensions? The biggest thing was that it served as a reminder to not forget about taking care of myself. It definitely gave me my confidence back! You have to give yourself permission to take time for you. 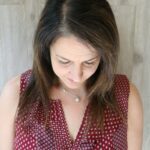 The confidence I gained helped me to get over that postpartum feeling of losing your identity a little bit. Did anything surprise you about your experience with wearing hair extensions? I didn’t realize before how much your hair can affect your life. If you feel like you look good, then you automatically feel good. It makes such a difference. 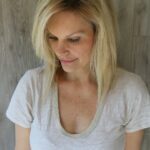 As a busy mom, what’s the biggest benefit of wearing hair extensions? I don’t have to worry about washing and fixing my hair every day! I went from washing my hair every single day to once or maybe twice a week. It’s the biggest time saver. What’s the number one things you would want other women to know about wearing hair extensions? Extensions gave me the dream hair that I could never have achieved otherwise. The confidence you gain is invaluable. And more than anything… Don’t forget about YOU. It’s okay to take the time to take care of yourself. If you relate to Susan’s experience and are curious about if hair extensions might work for you, visit garnishhairextensions.com to learn more. Tis the season of transformation! The weather has cooled, the leaves are changing colors, and here at Garnish we are in full-on hair makeover mode. We wanted to show off some of our major transformations from the past few weeks because they are GORGEOUS if we do say so ourselves. First up is Susan’s Corrective Color + 3 Rows of NBR Extensions. Susan had been getting the same highlights for a long time, but was ready to change up her look. Candice transformed her color into a melty, dimensional brunette before adding three rows of Natural Beaded Rows Extensions. Due to the length and thickness of her natural hair along with her goal length, 3 rows was necessary to achieve the perfect blend. Next up is Hayley’s Icy Mermaid hair dreams. Hayley wanted the coolest blonde and the longest hair, which Niko achieved through highlighting her natural hair and adding 3 Rows of NBR Extensions. It’s important to note that Hayley has been working towards icy blonde through previous highlights, as achieving this color in a healthy way takes time and patience. They added 3 Rows of NBR in order to create both volume and maximum length. Our third major transformation feature is Anna Kathryn’s Corrective Color and NBR Extensions by Reece. Anna Kathryn came to Reece with layers of box color on her hair which had not only dried out her hair, but left it looking super brassy. Reece used a multi-step process to gently remove the old color and refresh her brunette to create a shiny, consistent dark chocolate color. The next step was extension day! Reece added 2 and a half Rows of Natural Beaded Row Extensions to give Anna Kathryn the gorgeous model length hair she had been dreaming of. If you’re as in love with these transformations as we are and you’re ready for your own hair makeover, visit our book now page and fill out an application. We would love to help you achieve your hair goals! Everybody put your hands together as we officially welcome Reece Britt to the floor! So, what exactly does this mean? Well, if you’ve followed Garnish for more than about five minutes you know that we have an Academy here where our owner, Candice, trains new cosmetologists to become extension and color specialists. It’s an 18-24 month program that can pretty much be considered “grad school” for hair stylists. This means that by the time these stylists “hit the floor” to start accepting guests of their own they have spent at least one year training hands-on every day with an extension expert who has been behind the chair for over 15 years. In order to graduate from the “Assistant Phase” of the Academy Program into the “New Talent” phase, the stylist has to perform a number of hands-on “test-outs” of various color and extension work, along with passing a written test as well. They have been rigorously trained on formulating color, extension placement, and all the millions of details in between that make up the Garnish Experience. Once they pass the tests and become “New Talent” as Reece has just done, they are able to start accepting guests a few days a week as they continue to learn and grow. In celebration of his new promotion, we sat down with Reece to talk about his experience in the Academy, why he chose this career path, and what he’s most looking forward to about this next step. What has your experience been inside of the Academy? Why did you choose Garnish’s Academy Program? What does graduating into the New Talent portion of the Academy mean to you? What are you most looking forward to about starting your career at Garnish? Join us in congratulating Reece on his new promotion! We are so thankful to have such an energetic and passionate person as part of the Garnish Tribe, and we could not be more proud of the work that he does inside of the studio each day. We look forward to continuing to be a part of his undoubtedly incredible career. Whenever there’s a new craze you begin to see it everywhere. In the fashion world what typically happens is that every company rushes to create their version of the trend creating a multitude of offerings varying in quality and style. When it comes to hair trends, it takes a lot of continuing education, practice, and commitment to learning and growing your craft in order to truly master a new trend. That’s why we place such a huge emphasis on education—because we value staying ahead of the curve to consistently offer the best services at the highest quality. That’s also why we’ve been a part of the NBR Extension community for quite a while now. Hair extensions is a whole different universe inside of the hair industry requiring a different level of artistry and integrity. Women come into our studio every day placing their self-confidence, beauty goals, and vulnerabilities into our hands, and we take that as a huge responsibility. When Candice first learned of NBR, she chose not to offer it immediately to her guests because she realized that there was a level of practiced skill required in order to offer the service at the highest standard. She chose instead to attend an in-person class in Laguna with the NBR creator, Danielle, in order to study the craft on a first-hand level. After returning from class, Candice still chose not to offer the service immediately, instead taking the time to practice every single day in order to master the skill before offering it to her guests. Since that time, she has attended a number of courses and intensives on the method and has become both Level 3 Certified (the current highest level of certification) along with being a BMS Convention Trainer at their bi-annual conference. We have been offering the method in the studio for a year and a half and during that time our other extension specialist, Niko, has become Level 2 Certified, and our soon-to-be new stylist, Reece, has become Level 1 Certified. Candice implemented what is called a “power practice” into their training that requires 15 minutes of practice every day. As a studio, we believe in the method as one of the highest quality extension methods in existence due to the fact that it’s the maximum amount of hair achievable with the most minimal amount of attachment points. This means it’s one of the safest methods for your natural hair with proper extension care. It also means it allows your natural hair the most “room” to grow as it’s such a delicate, seamless method. And it’s because we believe this that we’ve dedicated so much time, energy, and resources to ensure we are highly trained and skilled in offering the service. With our transition into offering exclusively extension related services, we have been able to hone our skills even further, ensuring that no matter which stylist you see at Garnish, you will be taken care of with the same level of understanding for the method, and you can feel comfortable knowing every stylist has practiced extensively to perfect their craft. We are super passionate about Natural Beaded Rows as a method, and we believe in the incredible transformations we have been able to create through NBR. If you have any questions about the method, the process, the maintenance, or what’s achievable for you—call us! We would love to talk you through it. 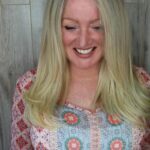 You can also visit garnishhairextensions.com to hear firsthand from Candice about how NBR changed her life, and the steps to take in order for it to change yours, too. We wanted to shine some light on a couple of our recent transformations by Extension Stylist, Niko Jones. Extensions are often a part of a journey towards self-confidence and self-love and we absolutely love getting to be a part of that journey. Whether you’re looking for a little more volume, a lot more length, or a complete transformation, our specialty is helping you achieve your hair dreams. Niko has been pouring into her extension craft through weekly classes and on-site training with Natural Beaded Rows, and has truly been leveling up her extension game. Check out some of her most recent work below. First up is Jen’s Hairdreams Extensions Transformation. Jen has some previous damage to her hair and has a hard time achieving her ideal length. Her nano fusion extensions allow her to have some lightnes through the ends of her hair, while also giving her the length and fullness that she loves. We love that sometimes extensions can allow you to achieve your color goals that your natural hair may not be able to support. Our guests choose extensions for so many different reasons! Next up is Vickie’s Foilyage + NBR Extensions Transformation. Vickie was looking for fullness with a little bit of added length and an udpate to her color. Niko first created a new look for her color by adding a money piece (the brighter highlight in the front) while also adding dimension into her crown area to blend her grown out lighter ends. Vickie’s goal was for her color to look very natural so keeping it soft and blended created a beautiful natural honey blonde. They then added two and a half rows of NBR Extensions to achieve her length and fullness goals. How much do you LOVE this end look? Here at Garnish, we LOVE extensions. We love being able to give women the hair they have been dreaming of, and using extensions to do so. And while we specialize in semi-permanent methods of extensions, we also recognize that for some lifestyles that’s just not feasible. We also know that sometimes women want extensions for a particular event, or for special occasions, but not for an every day look. Traditionally, the solution for those ladies is clip-in extensions, but we wanted to shed some light on our personal favorite temporary extension method—HALO Extensions. Halos are bomb because they can be custom colored, custom cut, and are super easy to put on and take off. This means they work well for a lot of different women with many different looks. Longer halos can even be added into a low pony or braided, making them ideal for special events and wedding hair. The versatility of halos is one of our favorite aspects. They come in several different lengths, layered, and balayaged, and they can also be custom colored in a variety of ways to perfectly blend with your hair. Garnish Hair Extension Artist have got you covered! If you’re interested in extensions, but aren’t ready for the commitment of semi-permanent methods, Halo Extensions are an amazing alternative. If you’re looking to add length, but your hair is already relatively thick, it’s even possible to wear two halos to achieve your hair goals. Garnish owner, Candice, wore two halos for months before she transitioned to NBR Extensions! If you have any questions regarding Halo Extensions, if they are the right fit for you, and how they can help you achieve your goal look—give us a call or fill out an extension application. We would love to introduce you to this amazing temporary extension method. About a month and a half into wearing my extensions (right about the time I learned how to make them fluff), I attempted to run my hand through my hair and, um, well… it got stuck. I ignored it for a day or so until I tried again and it was even worse. That’s when I started feeling around at the root of my rows and came to a horrifying realization. I had a mat… in each row… right at the back of my head. I was pretty sure Candice was going to kick me out of Garnish or take away my extensions because how on Earth could I manage an EXTENSION BAR and have mats in my head. Thankfully, she and Reece rescued me with the help of copious amounts of Know Knott. And then I got a remedial lesson on how to properly comb out my extensions. The fluff sure LOOKS great, but if it’s not combed out at the beginning and end of each day then it’s GOING to be a mess—promise. As if that’s not bad enough… I also had a mental snafu so-to-speak when I thought I might have acquired a bald spot. To be clear—I did NOT have a bald spot, but I definitely thought I did and was having a low-key crisis about it. With NBR extensions, the anchor bead (aka the first one in the row) pulls the hair slightly sideways. You don’t feel it at all, but if you look right at the spot where the hair is going in a different direction than usual it APPEARS that you could be missing a few strands. They’re not missing, just “displaced” so-to-speak, and once I realized that I definitely felt a bit silly for stressing. THEN (because yes, there’s another one)… I was experiencing terrible itching at my scalp and I had no idea why. I mean, I had JUST washed my hair. Welp. Turns out I wasn’t washing my hair properly either. My natural hair is very dense to begin with so adding in 4 rows of extensions meant that particularly at the root it’s just hair stacked on top of hair stacked on top of more hair. According to the maintenance sheet you’re supposed to separate out each row and wash and comb them individually. I definitely was NOT doing that properly. Once again, one of my team members rescued me and washed all of the shampoo residue out of my hair and I’ve been extra thorough washing ever since. I have one last confession, and this is the one that surprised me the most. Candice had explained to me that often when extensions are removed the person feels like their natural hair is thinner than before. As someone who naturally has a ton of hair I was certain this would not affect me. I was definitely wrong. I had to go three days without my extensions and it felt like i had NO HAIR. Considering how much hair I have, it’s a ridiculous thought/feeling, but our brains are tricky. They adjust to the feel of how much hair you have with extensions so when they’re removed suddenly your brain thinks something is missing! It’s a crazy feeling, but definitely a valid one. While it’s a bit embarrassing to admit all of my extension snafus, I felt like it was important to let you all know that following the maintenance is extremely important for avoiding challenges. And, of course, that snafus DO happen and as long as you address them, they won’t result in damage to your extensions or hair. Finally, I wanted to share my experience for anyone else who has had their own extension snafu to let you know that you are not alone. There is definitely a learning curve with extensions and (unless you manage an extension salon and helped write the maintenance sheet) there’s nothing to be embarrassed about. If you ever have any questions PLEASE give us a call. We can help you troubleshoot, find solutions, and get back to loving your extension hair. No seriously, we really LOVE hair extensions. We love being able to help women find solutions for their hair needs whether that’s added length, more volume for the length they already have, or filling in skinny ends that won’t grow. Hair Extensions can create such a beautiful transformation, and provide an amazing solution for so many hair needs. There are, however, some hair concerns that traditional extensions cannot solve. Over the past decade that Candice has been applying hair extensions she has seen a wide variety of women’s hair needs, and has made it her mission to learn all she can to assist as many women as possible. While we love a beautiful set of extensions, what means the most is being able to actually provide solutions for women who don’t know where else to turn. This has led us to the commitment to level up the services that we offer here at Garnish. We’re doing this in a couple of different ways. If you’ve never heard of Crown Hair Extensions before, prepare to be amazed. Crown Hair Extensions are a method of extension that can be applied to areas of hair loss and excessive thinning in ways that traditional extensions cannot. They provide coverage that blends perfectly into the natural hair, including a natural looking part. For women experiencing hair loss, bald spots, and “see-through” hair, Crown Extensions can provide a beautiful solution. Because Candice believes in not just finding a cosmetic solution to hair needs, but in actually being able to help women solve the underlying issue—IF medically possible—she has also begun training in Trichology. Candice along with Donyata, attended a training event in Florida recently, and will continue to partake in ongoing training to become Trichology Specialists. Trichology is the study of hair loss and scalp conditions, and will allow Candice and Donyata to look at your scalp, evaluate its health and what treatments might help, along with determining if you may be a good fit for hair regrowth laser technology. The technology of the Trichology evaluations will not only help women seeking assistance with hair concerns related to extensions, but also for women with scalp issues such as itching, dandruff, excessive oil production, and more. We will be able to offer treatments tailored to each person’s needs, increasing their scalp health—which in turn leads to healthier hair. At Garnish we are constantly seeking ways to go above and beyond your average salon in what we can offer for your hair needs and goals. Trichology will allow us to help each person who sits in our chairs in an even more in depth way. If you have any questions about Trichology, and what that will bring to Garnish, please feel free to reach out and chat with us about it. We would love to talk to you about how we can help your hair—and YOU—feel amazing. As a salon committed to continuing education, Garnish sets aside a day each month to further our growth. Last month the stylist team spent the day with Balmain educator, Nathaniel, to learn about Balmain Double Hair Extensions. Double Hair Extensions are an excellent way to add volume to fine or medium weight hair, along with some length as well. They are a type of micro-link extensions, using wefts of hair. A person’s natural hair is threaded through links in the center of the weft and then secured safely in the insulated bonds, producing beautiful voluminous results. Take a look at how our day with Balmain went!